Preheat oven to 350F. Spray a nine-inch round pie dish very well with cooking spray; set apart. I used a pitcher pie dish; baking times may range if using metallic. To a huge bowl, upload 1 cup sugar, flour, cinnamon, salt, and whisk to combine; set apart. To a medium microwave-safe bowl, upload the butter and warmth on excessive strength to soften, approximately 45 seconds. Wait momentarily earlier than including the eggs so you don’t scramble them. Ad the eggs, extracts, and whisk to mix. Pour the wet aggregate over the dry and stir to mix; don’t overmix. Add 2 cups blueberries and stir to mix; batter may be very thick. Turn aggregate out into prepared pie dish, smoothing the pinnacle gently with a spatula. 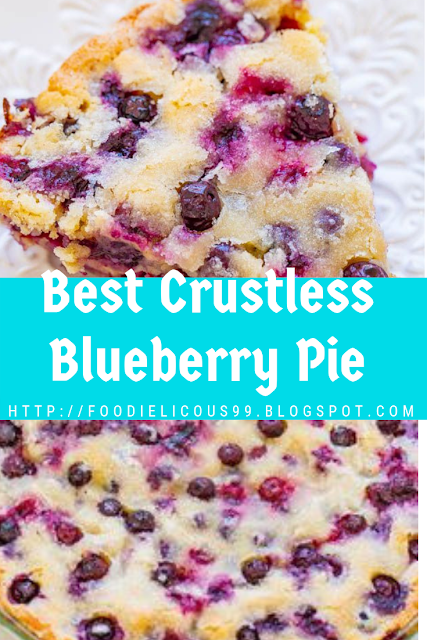 Evenly sprinkle 1/4 cup blueberries over the top. Evenly sprinkle 2 tablespoons sugar over the pinnacle and bake for approximately 34 to 39 mins, or until edges are set and a toothpick inserted in the center comes out easy or with some wet crumbs however no batter. I favor to underbake slightly (35 mins) for a more gooey center but it’s non-public desire and because all ovens, climates, and berries range, watch your pie and not the clock. Allow pie to cool in pie dish on a cord rack before slicing and serving. Optionally serve with whipped topping or ice cream. Pie will maintain airtight at room temp for up to five days.